The ARPM Lab® (Advanced Risk and Portfolio Management Lab) is a constantly updated online platform for learning and teaching quantitative finance. The ARPM Lab spans the entire spectrum of Quantitative Finance, across Asset Management, Banking, and Insurance, from the foundations to the most advanced developments. all major asset classes: equities (public/private), fixed-income, credit, currencies, alternatives, high-frequency, enterprise, etc. the most advanced quantitative techniques: data science and machine learning, factor modeling, portfolio construction, algorithmic trading, investment risk measurement, liquidity modeling, enterprise risk management, etc. While most materials on quantitative finance focus on asset pricing and risk neutral valuation (“Q”), the ARPM Lab focuses on the much broader applications to real world probability (“P”, more at Section 1). The ARPM Lab is developed “bottom-up” to address the practitioners’ needs, but is organized and presented “top-down” in a structured, academic manner, built around the sequential steps of the business process (Figure 1): valuation, ex-ante risk/portfolio management (the “Checklist”), and ex-post performance analysis. Part I - the “Checklist”. 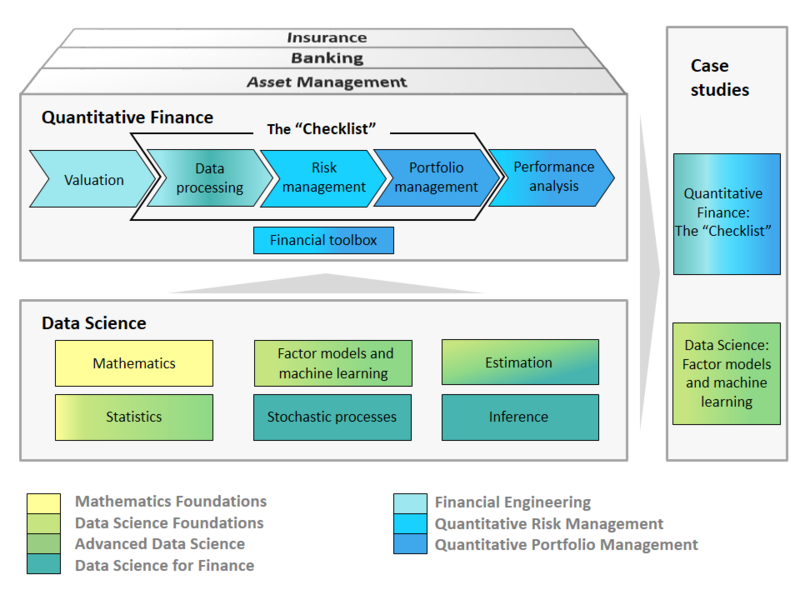 This represents the core of the ARPM Lab and consists of 10 sequential steps to model, assess, and improve the performance of the portfolio/firm, refer to Figure 0.1. The first 5 steps (Data Processing) prepare all the required econometric and analytical background. The next 3 steps (Risk Management) discuss how to measure the risk profile of the portfolio/firm. The last 2 steps (Portfolio Management) discuss how to optimize the risk profile of the portfolio/firm, which is the ultimate goal of financial practitioners across the industry (asset management, banking, insurance). In addition to the core steps of the “Checklist”, other pieces are crucial to fully understand and implement Advanced Risk and Portfolio Management (Figure 1). Part II - Factor models and learning. This provides a deep understanding of factor models, which are used across the ten steps of the “Checklist” (Part I), as well as Valuation (Part III) and Performance analysis (Part IV). Machine Learning with its numerous connections with factor models is also covered in Part II. Part III - Valuation. This is a “prequel” to the “Checklist”. Risk management and portfolio management aim to forecast, assess, and improve future (“ex-ante”) performance, which ultimately is the future change in value of our portfolio. But to improve the future value we need to first know, or compute, the current value. In this part we provide a holistic treatment of valuation across liquidity buckets (bid/ask or mark-to-market versus mark-to-model), and across models (risk-neutral models for derivative traders versus real-measure models for investment bankers and actuaries). Part IV - Performance analysis. This is a “sequel” to the “Checklist”. We first delve into the various definitions of performance (linear/compounded return, absolute/excess return, drawdown, cash component versus appreciation, etc.). Then we discuss the attribution of realized (“ex-post”) performance to different decisions and stakeholders. Part V - Quant toolbox. This is a set of quantitative techniques used throughout the ARPM Lab. Table 1: Fundamental blocks of Advanced Risk and Portfolio Management. This is what we do in the ARPM Bootcamp® and the ARPM Marathon®. The same four modules are tested in the exams for the ARPM Certificate®, which proves proficiency across all the parts of the ARPM Lab. Different people learn in different ways. To facilitate the different learning styles of disparate audiences, the ARPM Lab is accessible via a variety of interconnected Learning Channels. The interconnections among the channels maximize the effectiveness of unstructured, “bottom-up” learning, which does not follow the recommended dependencies of the four Learning Modules. For instance, one may land on a piece of interactive code, and follow the code forward and backward across different topics; or switch to the theory on that topic to deepen understanding, or watch a video first, and then try an exercise. The Theory is the pillar of the ARPM Lab. Explanations with formulas are self-contained, and laid out with grueling attention to a consistent notation, which facilitates connections across disparate topics. Geometrical arguments support intuition, and heuristics are favored over mathematical rigor. The Case studies illustrate the theory using real data, large simulations, or large-scale analytical results. The user can replicate the Case studies with the code, also provided. The Case studies are wrapped in borderd light blue boxes, and signaled by the image of a cog . The Toy examples illustrate the theory with the simplest possible implementations, in order to solidify the intuition of abstract theoretical concepts. The Toy examples are wrapped in light blue boxes with no border, and signaled by the image of a bulb . The Data animations, generated from data using code, explain complex models with visualizations in motion. To access the Data animations, users should click on the “play” icon on the right of a figure/still frame. The Documentation is a step-by-step description in language-neutral pseudocode of all the details about the Code. The Documentation also includes cross references to the Code and to the Theory. To access the Documentation, the user can click on the documentation icon . The Code allows the user to absorb hands-on the contents of the ARPM Lab, understanding all the practical implications behind the Theory. The Code is editable and executable interactively from any browser, without any software installation. The Code is available in Python, MATLAB® and R. To access the Code, the user can click on the code icon , and then select the language of choice. The Slides summarize all the materials. To access the multi-media Slides, the user can click on the slide icon at the top of each page. The Video lectures are video recordings, one per section, featuring an ARPM Instructor who walks the reader across the ARPM Lab. The Video lectures can be viewed one at a time, by clicking on the video lecture icon at the top of each page; they can also be viewed in sequence, clicking on the “previous”/“next” arrows on top of each recording. The Video lectures are available in two formats: Bootcamp and Marathon. The Bootcamp Video lectures provide a faster overview of the ARPM Lab, for a total of 30 hours of recording, and cover the program of the ARPM Bootcamp; the Marathon Video lectures provide an in-depth overview of the ARPM Lab, for a total of 150 hours of recording, and cover the program of the ARPM Marathon. The Exercises support the learning and help the user master the analytical aspects of the Theory. To access the Exercises, the user can click on the exercises icon . Access to the ARPM experience through different, interconnected channels ( Section 1) enables a diverse audience to benefit from it. A solid quantitative background from an undergraduate program in the hard sciences allows for full absorption of the materials. No finance or coding knowledge are necessary, as both are developed during the ARPM experience. The following categories represent the ideal audience for the ARPM experience. Risk managers and portfolio managers with an undergraduate degree in the hard sciences, who wish to learn the principles behind the recipes that they implement every day, and wish to access a comprehensive reference for the most advanced techniques in their field. Computer/data scientists, who want to learn the financial applications of their skills. Derivative quants and quantitative actuaries, who wish to quickly switch from their field to a new one, leveraging the mathematical knowledge they already possess. Students (advanced undergraduates and master level) in quantitative finance and hard sciences. Academics in the hard sciences, who wish to learn and/or teach data science for finance, risk management, and portfolio management in the concise, rigorous language to which they are accustomed. Throughout the ARPM experience, intuition is supported by visualizations. Heuristic arguments are favored over mathematical rigor. The mathematical formalism is used up to, and not beyond, the point where it eases the comprehension of the subject. Linear algebra: matrix/vector notation and manipulations, trace, determinant, eigenvectors, eigenvalues. Multivariate calculus: derivatives, integrals, and Taylor expansions. Statistics: basic concepts of distributions, probability density function, and cumulative distribution function. For users interested in brushing up their mathematics with a focus on applications, a Mathematics Refresher is available. No coding experience is needed to fully benefit from the ARPM experience: coding skills can be, although need not be, acquired along the way, by working through the interactive code provided. However, for users interested in learning to code or brushing up their coding skills, Coding Refreshers in the supported languages are available. No knowledge of finance is necessary to benefit from the ARPM experience, although prior exposure to basic financial products would make the absorption of the materials faster.